Click magazine to read in full screen. Fast, fun, and fan-friendly, DCI's SoundSport program is already making waves around the world—and connecting more musicians to DCI's brand of excellence. Whether it's planning the schedule, manning the turnstiles, judging the action, or organizing things on show day, it takes a dedicated team to make the DCI season come together. Randall May explains how advances in drum carriers are taking the load off marching percussionists. Three drum corps alums have spent the year teaching marching music to students in China and Taiwan. 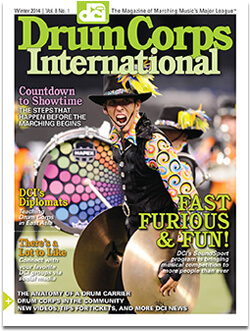 DCI's World and Open Class corps find plenty to "Like" on Facebook. Blue Stars at 50 ... DrumLine Battle debuts at PASIC ... DCI corps show community spirit ... Championship videos, tickets, hotel specials ... and more!